Eugene Victor Debs (1855 - 1926) was a founder and leader of the American Railway Union (ARU), founded on June 20, 1893, it was the largest union of its time. When workers at the Pullman Company went on strike in the summer of 1894, Debs led the ARU in a sympathy strike against Pullman that resulted in nationwide disruption of rail service and delivery of mail, extensive rioting, violence and numerous deaths in clashes with federal and state military and local law enforcement. It was one of the most important labor battles in the history of the United States. Debs and other ARU members were later charged with civil contempt for violating a federal court injunction and were sentenced to prison. They were also charged with criminal conspiracy for disrupting the delivery of U.S. mail. Clarence Darrow worked with other lawyers to defend Debs and the criminal charges were dropped. They also challenged the civil contempt proceedings before the United States Supreme Court. Debs later become a socialist and was chosen to run for President five times as the socialist candidate. Clarence Seward Darrow (April 18, 1857 Kinsman Township, Trumbull County, Ohio - March 13, 1938 Chicago) was one the most famous lawyers in the history of the United States. His fame came from several notable trials including his defense of Leopold and Loeb for murdering 14-year-old Bobby Franks (1924) and defending John T. Scopes who was charged with teaching evolution in a Tennessee public school (1925), in which he opposed the famous statesman William Jennings Bryan. Darrow was also known for his outspoken agnosticism, blunt and controversial comments on social issues, sarcasm, wit and as a defender of civil liberties. In 1918 Eugene Debs was convicted of violating the Espionage Act because of his opposition to World War I. He was sentenced to 10 years in the Federal Penitentiary in Atlanta. 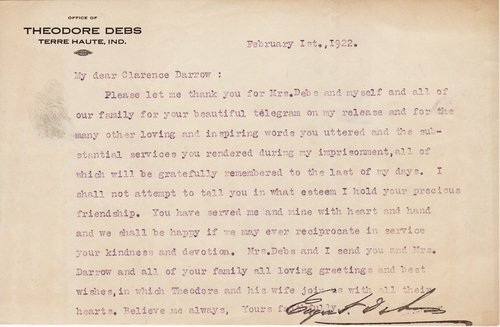 Clarence Darrow worked on getting Debs pardoned or his sentence commuted. Republican President Warren G. Harding commuted Debs' sentence to time served and he was released on December 25, 1921. Harding's Attorney General Harry M. Dougherty was instrumental in obtaining the commutation. Theodore was Eugene Debs' brother.